Cleverly Solved | Can I plug a modern wood stove with a Chimney Balloon when I am not using it? 29 Mar Can I plug a modern wood stove with a Chimney Balloon when I am not using it? A: Dear TW, It depends on what type of stove you have. 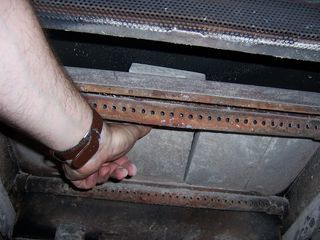 The image to the left is the inside top of an Avalon woodstove that has firebrick baffles on the top of the firebox. These brick baffles can be removed and it gives you easy access to the round flue so you can install a 9×9 Chimney Balloon when it is not being used. In the picture, you can see the one brick is being lifted because they just set in there by gravity. 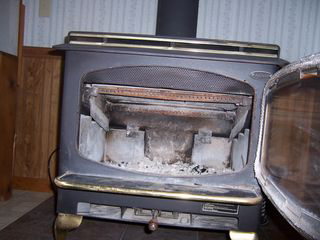 Other wood stoves are completely metal-clad in the firebox and the baffles are welded steel. In these fireplaces, you often have no access to the flue through the firebox. On occasion, you can get access to another part of the chimney through a clean-out door portal. Usually, these are outside and near a bend in the chimney or pipe.